After enduring catastrophic rainfall and flooding as a result of Hurricane Harvey, the southeast United States, specifically South Florida, now embraces for category 5 Hurricane Irma. Already one of the strongest storms every recorded in the Atlantic region, the powerful hurricane is expected to bring storm surges of 7 to 11 feet when it makes landfall in Florida this week. In case of any emergency, you should always have a disaster survival kit that you and your family update every so often. Include items like bottled water, non-perishable food, flashlights, batteries (for radios, flashlights), and a first aid medical kit. If you need to, buy items early because before a hurricane grocery stores often sell out of items like water. Also, remember to write down important emergency contact information and grab any insurance documents, as well as essential medications. Don’t forget cell phone chargers, either. Assuming there’s adequate time, secure both your personal possessions as well as the home itself. For example, you can move furniture, sacred valuables, hazardous materials, and important documents to higher ground inside your home — somewhere like a 2nd floor or attic. For safety, remember to shut off the main power supply to your home, as well as unplug electronics. Also, secure any items or outdoor furniture that may be picked up by high winds. If you have a mobile home, ensure that it is anchored. In addition to protecting you and your family, make sure to look after any elderly family members or neighbors. For example, before the storm hits ask elderly individuals in your building or neighborhood to if they need any assistance evacuating. Also, don’t forget about pets — both domesticated and farm animals. If necessary, make special arrangements for safe transport of your pets while remembering to bring any pet medications and enough food to last through the ordeal. If you need a safe place for your pet during the disaster, contact the ASPCA of Miami Dade County, FL animal shelter or find a local shelter at PetFriendlyTravel.com. 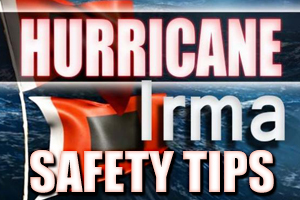 If your home is in the path of Hurricane Irma or if your property stands to be affected, the most important to do is listen to local authorities regarding evacuations and safety precautions. If ordered to evacuate the area, make sure you do so as soon as possible. This is because avoiding the center of a storm will provide an extra layer of safety. There are also some preventative measures you can take to potentially minimize the damage a hurricane does to your home or business. These include boarding up windows with plywood, covering doors with sandbags, and shutting off utilities. All of these actions can lessen the impact of a hurricane on your property. If you need to evacuate the South Florida area, try to stay with a family member or a friend outside of the potential disaster zone. Another option is using saved up emergency funds for a hotel or motel stay. Finally, those without local relatives can find a shelter in the area for safety. It’s also important to stay informed, in any way you can. This is because you’ll want to follow things like weather updates, shelters, blocked roads, etc. With this in mind, make sure you have access to a communication device, whether it’s a T.V., computer, radio, or your cell phone. Once a disaster like a hurricane occurs, your focus should shift to keeping you and your family safe. 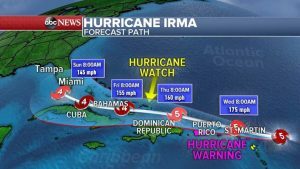 Hurricanes and resulting flooding are extremely dangerous, potentially live-threatening emergencies so it’s important to stay updated on the latest information regarding Hurricane Irma. Having as much, up-to-the-minute information as possible is essential during a disaster. Due to this fact always stay informed on the storm, even if the power goes out. This may mean investing in a battery-powered radio or television. If you have internet access, try utilizing the Miami Red Cross website. You can also download the free Red Cross Emergency mobile app on your Apple iPhone or Android smartphone. Finally, don’t forget to bring a phone charger with you wherever you go. Let your family members and close friends know that you’re safe during Hurricane Irma by registering at Safe and Well. Also, stay in touch with your employer to discus expectations and your children’s schools to learn about closures. Communicate any emergencies to the proper response teams: Call 911, Emergency Response at (800) 320-0519, or the Florida Emergency Information 24/7 hotline at (800) 342-3557 if you need immediate emergency assistance in South Florida. 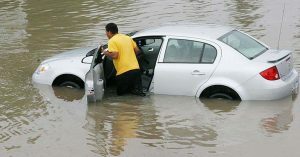 In fact, avoid driving altogether during a hurricane or flooding. This is due to the fact that when a flash flood occurs it usually happens really fast, resulting in local highways and roadways becoming completely submerged in flood water and thus unsafe for vehicle use. 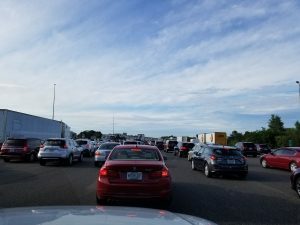 The only time you should ever drive during a storm is before it hits, to evacuate the area. Communicate with your employer if heavy rain or flooding causes roadways to close and you’re unable to come to work. This is especially true if you’re a parent or caretaker. During distressful times like a hurricane, it’s important that someone stays calm and collected for the good of the group. You’re much more likely to stay focused, informed, and alert if you’re not in a state of panic. And if you are experiencing a true emergency, call 911 or call Emergency Response at (800) 320-0519. When it comes to powerful storms like Hurricane Irma, the biggest concern for homeowners is water damage not from the excess rainfall but from flooding. Often times, local rivers overflow with water or the city’s sewage systems can’t properly drain all of the excess water. When this occurs, entire homes can fill up with flood water. We don’t have to tell you what sort of damage can occur to both your property and your possessions once unsanitary flood water penetrates them. In fact, a property owner only has about 24-48 hours to address excess water damage before both the home and everything inside it becomes at risk for mold and mildew infestation. If flood water inside of your home or business originates from an unsanitary source such as an overflowed river or overwhelmed sewage system, then your property is at much more risk for a mold outbreak. This is due to the fact that category 3 water, or unsanitary black water, is highly susceptible to both bacteria and fungus growth. Once mold or fungus infestation develops inside of your property, a thorough mold inspection followed by complete remediation by certified professionals is needed as soon as possible to mitigate the mold damage and stop any infestation from spreading. For Miami and the South Florida area, a FREE mold inspection can be scheduled here. If closing, clearly display this somewhere on your storefront. Also, remember to temporary change the outgoing message on any answering services. If your business cannot withstand closing its doors for any length of time, try securing a safer facility further inland away from the disaster. If not possible, offer to let employees work remotely. However, keep in mind that many local residents may be without power and thus unable to use electronic equipment such as a computer. Regardless of whether or not you close your business, remember to stay in constant communication with your employees. You’ll want to communicate to employees important information such as whether or not they need to come in, hours of operation, alternatives to coming in, etc. Create a contact list for everyone at your company to ensure that nobody is left off of correspondences. The last thing you want is an employee mistakenly traveling through flood waters to get to a closed office. Hurricanes and storms can knock out communication centers and servers where valuable business data is often stored. Have your IT team test your servers, backup servers, and other off-site sources before a storm hits. Make sure you have access to all business data so that you can backup important files and folders. You can also store information off-site at a secondary source, like the cloud. We hope that everyone in Miami, the Florida Keys, and everyone in South Florida stays safe during Hurricane Irma. Follow the safety tips above and in the links provided, use emergency contact information, and remember your disaster survival kits. 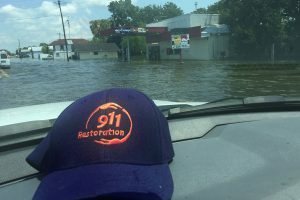 And if you need restoration assistance for your home or business after the storm, don’t hesitate to contact 911 Restoration of Miami. We’ve been in this situation ourselves and want to make the recovery process as smooth & stress-free as possible for our customers so they can get back to their homes as soon as possible. And if you’re in surrounding area of South Florida, we’ve got 911 Restoration branches in Tampa, Orlando, West Palm Beach, Jacksonville, Pensacola, and Naples as well.